Gorgeous and scarce set of jewelry issued by Hickok Jewelry, sold during the 1939 holiday season to promote ''Gone With the Wind,'' which was released in January 1940. 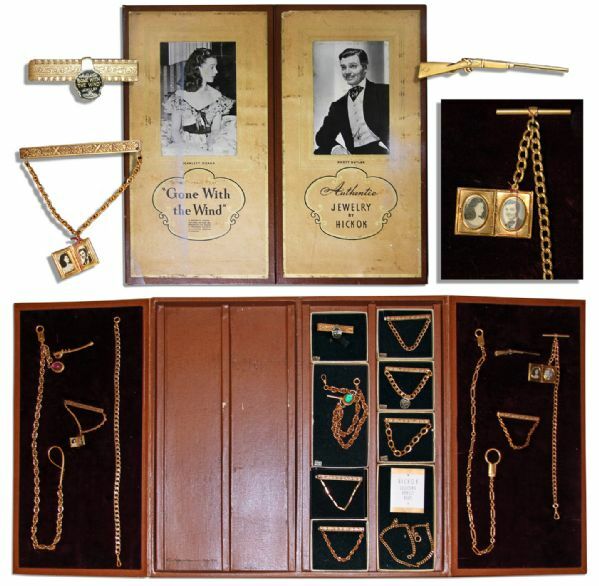 Clark Gable promoted the jewelry collection in advertisements for Hickok, and this set was reportedly owned by the then Vice President of the company. Is it possibly a salesman's sample, as each piece of jewelry is carefully laid out in a display box with prices. Set consists of a necklace and tie clip each featuring lockets with photos of Scarlett O'Hara and Rhett Butler, four additional necklaces, seven additional tie clips, one gold chain and two pins -- one a rifle and one a sword. All items are fashioned in the design of ''Gone With the Wind'' in gold finish and opulently-colored faux jewels. All pieces are laid out in the original fold-out presentation box that features photos of Scarlett O'Hara and Rhett Butler on the cover. All jewelry pieces are stamped ''Hickok'' and are in very good to near fine condition with working clasps. Box measuring 16'' x 15'' has some discoloration and abrasions; overall very good condition. A beautiful and scarce set, perhaps the only one now still available.